Good to see Sports Minister Gerry Sutcliffe put in a brief appearance at the National Clay Shooting Centre at Bisley this morning to lend his support to National Shooting Week. He watched Britain's Olympic hopeful Charlotte Kerwood give a demonstration of trap shooting, and gave a TV interview in which he recognised the achievements of Britain's shooters in international competition. "With the UK teams doing so well winning medals in so many competitions right across the world shooting is high on our list of sports we want to support," he said. "National Shooting Week gives an opportunity for all the misconceptions about shooting to be put to one side ... it gives people an opportunity to understand that this is a sport that can be for everybody, people with disabilities, people with abilities can get involved in shooting and it is a sport that people enjoy. I hope that my visit today in National Shooting Week and the work that Martin Salter is doing developing the liaison between government and shooting gives people a positive message, we want to see the sport do well." The Countryside Alliance deserve a huge pat on the back for what is undoubtedly a major PR coup. 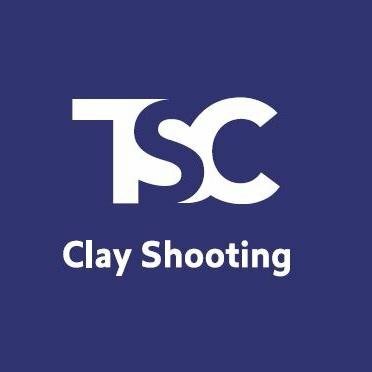 It was the CA who created, funded and organised National Shooting Week, on behalf of the British Shooting Sports Council - and it's no mean feat to get a government minister along to an event like this to show support for shooting. Mark Gilchrist in action at Earl's Court. This time next year, there's every chance that beavers will be deliberately released into "the wild" (wherever that is) in Scotland as part of an official reintroduction programme. Meanwhile those same people are frantically hunting down a couple of beavers that have jumped the gun, and got themselves released ahead of time, without the right papers. Officials are quoted in The Scotsman as worrying that they may be lonely, diseased, or the wrong type of beaver. Or all of the above. They are setting traps baited with carrots and apples, which are known to work well for beavers. You have to wonder at the modern trend towards micro-managing wildlife along with everything else. At this rate we'll be issuing sparrowhawks with licences to catch birds, checking the passports of migrating swallows, and giving salmon parking tickets if they linger too long in the sea-pool! Seriously though, if you manage a wilderness - by planting species you think ought to be there, and weeding out species you think shouldn't - then it isn't a wilderness any more, it's a garden. Incidentally, if you feel tempted to do your own research on the topic, make sure you google "hunting beaver" and not "beaver hunt", which apparently means something else entirely! I'm looking forward to visiting the Real Food Festival, at Earl's Court in London over the next few days (24-27 April). Sporting Shooter's chef and game food expert, Mark Gilchrist, will be there as Game For Everything. The Telegraph, one of the show's sponsors, have put together a couple of videos with Mark, on cooking pigeon and rabbit - watch them here. Lynxes and wolves and bears, oh my! Did you catch the BBC programme about Paul Lister and his plans to introduce 'native' species to his Highland estate, Alladale? It's sparked a huge debate. If you missed it, you can still catch it for the next few days on the BBC's wonderful iPlayer here: www.bbc.co.uk/iplayer. For the record, I visited Alladale in 2005, and we published a feature about Lister's plans in our September issue that year. My own view on the programme? Well, never has the English language been so twisted by so many for their own ends. Labels like "natural", "rewilding" and "freedom" were bandied about by all sides, as if giving something a name made it right or wrong. It's like saying predators are "good" or "bad" - it completely misses the point. But it seems that's the way the media - and wildlife politics - works. Plus I'm bemused by the current fashion for reintroducing "native" species and trying to push the countryside back to some golden age when all was wonderful and natural and man hadn't got his grubby hands on it. That's like reading the Famous Five and trying to turn the clock back to the days of steam trains and lashings of ginger beer. Besides, how far back is "right"? Forget wolves and bears, perhaps we should be repopulating the Highlands with Diplodocus and Tyrannosaurus Rex? Is rabbit disease spread deliberately? I just had a call from a shooter in Cheshire who is convinced that "someone" is deliberately spreading VHD among the local rabbits (more on rabbit VHD here). He says that this time last year there were thousands of rabbits on the farms around him. Then he spotted a few tame rabbits running around - and within days the wild population was decimated with VHD. He hung up his guns, and is still holding back from shooting rabbits, although it looks as though the survivors are breeding successfully this season. So... it's well known that farmers deliberately spread myxomatosis around Britain in the 50s. Now there's a powerful conspiracy theory gaining momentum - eg see this website on the situation in Australia and NZ. But in the UK? I know, I know - it's been ages! Well, I've been working on all those videos, oh and getting the magazine out too! This one includes crow shooting in Fife with Andy Richardson, lamping foxes with Robert Bucknell (and some really helpful advice on dealing with litters of fox cubs), and an interview with Mike Roberts about the new BanGo. It's lined with hamster and it costs how much??! It's easy to be cynical about companies like Purdey charging huge amounts of money for clothing and accessories. OK, they do make exceedingly good guns - but does that justify paying three or four times the normal price for a hat, coat, etc? At least, that's what ran through my mind when I walked in to the famous South Audley Street Long Room for a sneak preview of the new Purdey range for this season. A plain woolly hat caught my eye - it looked nice and cosy for wildfowling, ferreting and the like. I picked it up and looked inside - and nearly fell over at the price tag of well over £100... for a woolly hat??! But then in walked Rori Thompson from Purdey's product development department. We got chatting, and things began to fall into place. He is clearly passionate about the clothes: not just the designs, but everything that goes into them, from the smallest button or stitching. 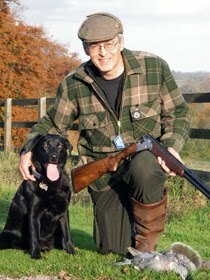 His line is that the Purdey name is associated with the very best in guns. They make guns the way they should be made, not down to a price. And that's how they approach the clothing. Which may take them to the Isle of Mull to track down the best traditional tweed for a particular coat. Or persuading an oldfashioned leather worker to come out of retirement to produce some special item for the range. Or in the case of the coat pictured at the top of this post, sourcing traditional hamster fur for a lining. What a fascinating job! So now I feel I understand why Purdey gear costs what it does. Sadly, however, I am no nearer to spending £100 on a woolly ferreting hat. But then I don't think I was ever their target market anyway! In case you're wondering, the coat pictured costs £650. The lining is extra, at £1,220! See the new range from September at www.purdey.com. Blundering along looking for rabbits today on the North Downs in Kent, I nearly stepped on this chap with my size ten-and-a-halfs. He was not impressed - slid off under a patch of bramble and hissed at me threateningly. I backed away and left him to it!